Every year we see plenty of exclusives - web site exclusives, convention exclusives, magazine exclusives, store exclusives, club exclusives - it's gotten to the point where the term 'exclusive' doesn't mean what it once did. These exclusives are often variants of main figures, and lots of people hate variants, at least the stupid kind. But not all variants are stupid - there are plenty that take on visually unique and amusing versions of important characters. Such is the case with the Germ Fighting Invader Zim. 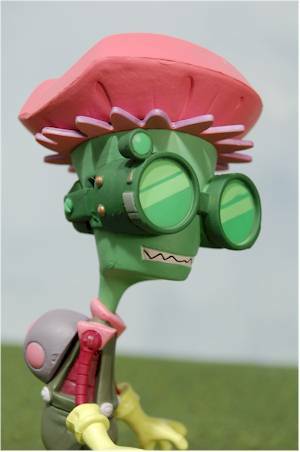 This isn't a common look for Zim by any means, but it was certainly visually amusing and very memorable. 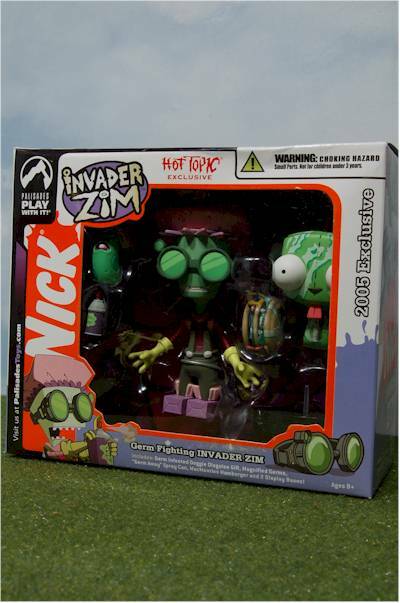 This exclusive, who comes pack with germ ridden version of doggy suit Gir, is a Hot Topic exclusive. They've had them for about a month now, and I'm a bit behind on this one. I was just going to skip it - God knows, with the new JLU three packs, and finally ML10 sitting here, I could have found something else to review tonight - but once I opened him up, I knew I had to talk about him. You can find this guy at most Hot Topic stores right now, and I THINK he runs around $25. I bought him a few weeks ago, and I'm going from memory, which ain't the greatest these days. I might love clamshells, but I love boxes more. Generally they have more art and text, are easier to store for the MIBBers, and easier to open and then re-close later. This package fills all those requirements nicely. I did notice that an awful lot of them were damaged though, so the MIBBers will want to pay special attention. This was *this* close to being a four star sculpt. I love the costume, and more importantly, I love the execution of the costume on this figure. While this might not be the most immediately recognizable Zim figure on my shelf, it's likely to become one of my very favorites. Two things stopped that perfect score. First, there's my pet peeve on getting a figure to stand on his own. Unfortunately, Zim does not, even with those huge feet. You'll need the included stand. The second is the very obvious burr mark around the edge of the cap. This is probably from mold leakage (which sounds a lot more painful than it is), but should have been removed before painting. That color just makes it all the more obvious, and it's the only visual problem that hurts an otherwise amazing sculpt. Occasionally, the Zim line has had paint issues. That's not the case here, and that is great, since there's such a wide array of colors used. The lines are clean and neat, with some great masking of the smaller areas. Colors are bright, and both the application and finish are even and smooth. I was particularly impressed with the germy infestation on Gir, which has even been slightly shadowed. This is the kind of paint ops that we know Palisades is capable of, and that's made them such a fan favorite with cartoon lines. Oh, there's still a stray mark here or there, and the occasionally sloppy edge line, but overall the paint compliments the sculpt extremely well. There really isn't much more articulation that you could add to these figures, simply due to the restrictions of the character designs. Zim has a cut neck though, and he would score better with some form of ball joint. he also has ball jointed shoulders, cut wrists (at the top of the gloves), and waist. You can do some basic arm poses, turn the head a little to and fro, and that's about it. 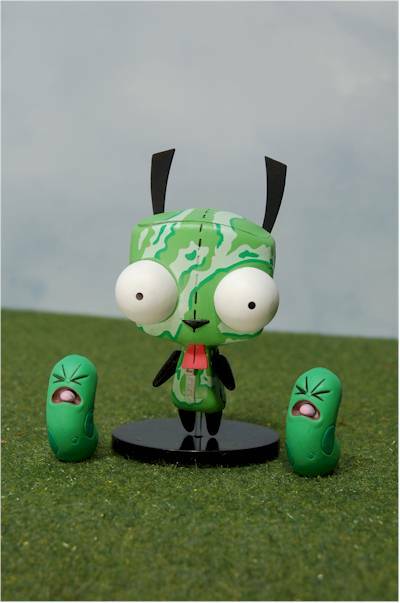 Gir is even more restricted, but damn, he's got some tiny limbs. There's a cut neck, ball jointed shoulders, and that's it. A few more accessories is always nice, and Palisades has spoiled us with some of the other Zim releases. Still, we get useful stuff here that makes perfect sense. Both figures come with display stands, which is good since I couldn't get either to stand without them. I expected that with Gir, and his stand includes a short piece of clear plastic to attach him to the black stand. The plastic is a little too short though, and he tended to lean since it didn't fit deeply enough into either hole. I'm sure you know what I'm talking about. I expected Zim to stand though, what with those big Kleenex boxes on his feet. But nope, I couldn't manage it without the black base. 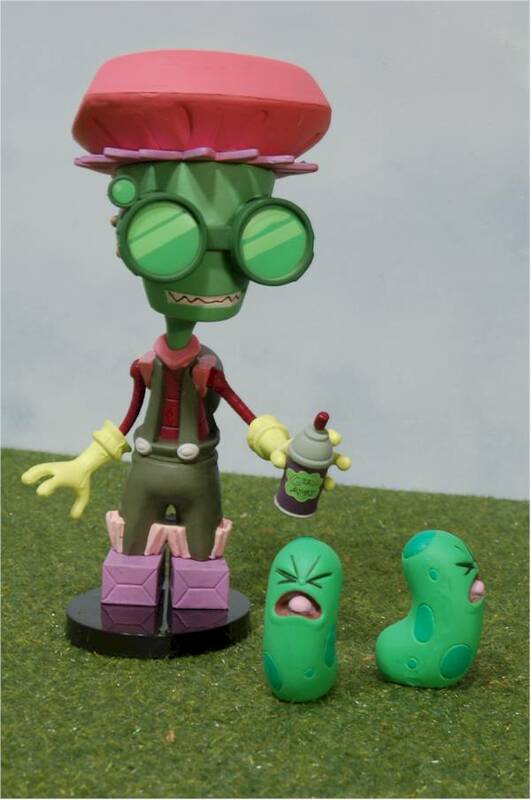 There's also a nifty little spray can of Germ Away that fits in either hand of Zim. There's also two rather large and nasty germs, identical in sculpt and paint of course. And finally, there's the sloppy burger. It's a nice smattering of accessories, but it still felt a little lacking. These are fun, although small kids will probably get frustrated with the tiny limbs and tough to manipulate joints. Still, with good articulation and great sculpting, these are just begging to be played with. I'm being a little soft on this guy - you're only getting two figures for around $25. Then again, there are two major factors involved - it's Hot Topic, a store notorious for high prices, and I'm betting the production run on these was VERY small. I didn't see any of the half dozen I've looked at that had serious paint issues, but it's always a good idea to keep your eyes on it just in case. This is a great figure, and an excellent exclusive. So often we get just simple redecos, or worse, basic repaints. Here, we are really getting a whole new figure, and a really cool one at that. 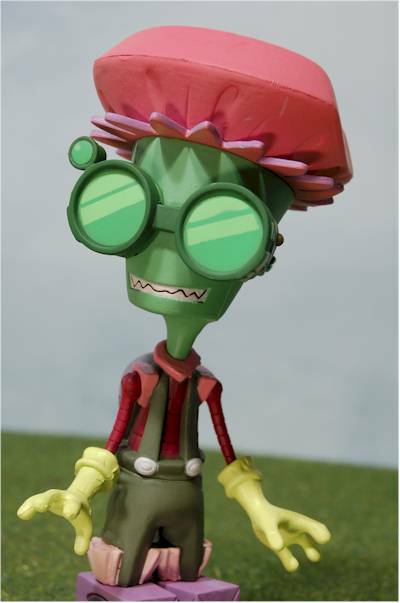 If I could only own one Zim figure, this wouldn't be it, simply because it's not a definitive version. But if I can own two, than this is the second one I'd buy. Hot Topic is the place, and it's not even at their online store right now. 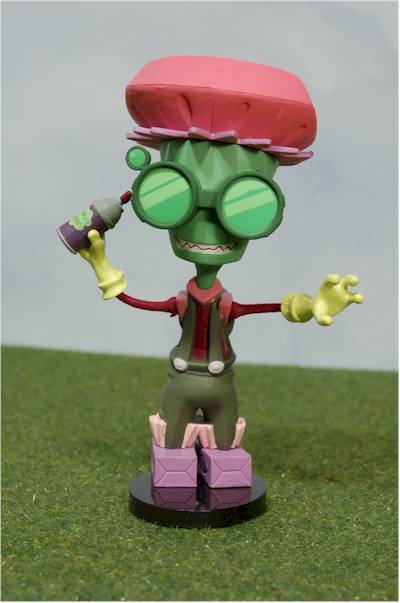 If you're looking for some of the regular release Zim items, many of my sponsors (like Circle Red, Killer Toys, OMGToys, Clark Toys, Yikes Comics, Amazing Toyz, and YouBuyNow) have the figures in stock. 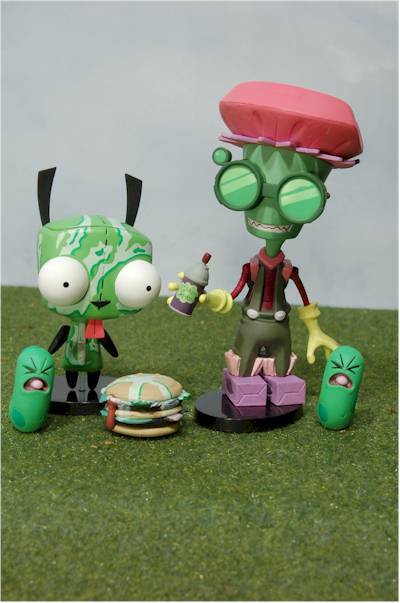 - I just reviewed the regular series 2 figures a few weeks ago, along with the Mega Gir. - Hot Topic has their exclusive versions of this series, and I have my review. 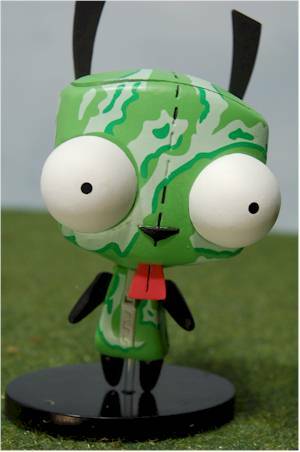 - here's the Wizard World Chicago exclusive Old Man Zim and Dog Suit Gir. - and the rest of the reviews, including the regular series 1, the Hot Topic series 1 exclusives, and the Angry Zim/Goofy Gir set. 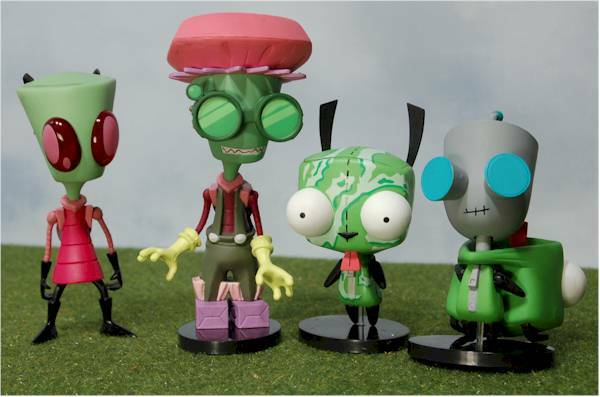 - and let's not forget the Zim DVD boxed set with the exclusive Gir figure!